Chobe Savanna is a brand new luxury lodge, located on a peninsula on the northern bank Chobe River in the East Caprivi of Namibia. The lodge overlooks the vast floodplains of the Chobe National Park's Puku Flats and is located approximately 90 kilometres due west of Victoria Falls. 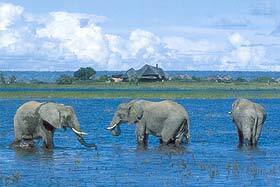 Access is by boat transfer from Botswana and it is also seasonally accessible by 4x4 vehicles from the Namibian side. 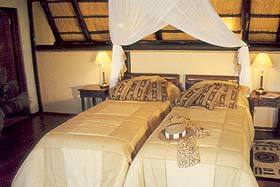 Chobe Savanna Lodge is owned and operated by Desert & Delta Safaris. Chobe Savanna is relaxed and informal, set in a classic African savanna environment with sweeping vistas surrounding the lodge. 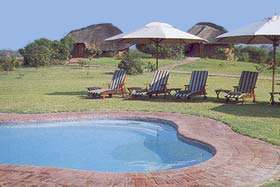 The focal point of the lodge is a thatched open-sided main building which commands a 270-degree view over the Chobe River and beyond to the Chobe National Park. Located in the main building are the lounge, dining room and bar, all furnished with African-style decor in dark teak wood, perfectly blending with the environment. The lodge accommodates just 24 guests in stylish thatched chalets, each with private deck, a combined bedroom / lounge area and en-suite bathrooms. All rooms are furnished in subtle earth tones and dark woods in a contemporary African theme, are air conditioned, and have complimentary mini bars and overhead ceiling fans. The charm of Chobe Savanna Lodge, with its sweeping views and wide vistas, lies in its beauty, tranquility and peaceful atmosphere, far from the crowds of large cruise boats and game drive vehicles. The emphasis here is on complete relaxation and solace. Unlike other properties, wherein regimented game activities are prioritized, Chobe Savanna Lodge offers guests the choice of just taking 'time out' or joining in on one of the many safari activities offered at the lodge. Depending upon the time of year, guests are also able to take a canoe excursion along the river. Facilities include an open-air swimming pool with a beautiful sun deck and an open boma area on the banks of the Chobe River where guests are treated to panoramic views and traditional dancing performed by local villagers. Activities: Those who wish to explore the Chobe River will enjoy the resident professional guides, whose intimate knowledge will make for an unforgettable experience. Guests have a choice of walking safaris or personalized guided cruises on one of the smaller water craft belonging to the Lodge, ideal for close up encounters with wildlife along the river's edge. There are also good fishing on offer. The waters around the lodge are renowned for outstanding Tiger and Bream fishing. Fishing expeditions with experienced guides and all necessary tackle can be arranged. For guests interested in learning about the cultures of the local communities that inhabit the Caprivi Strip, the lodge arranges private visits to remote villages. Here guests can observe the deep-rooted, traditional life styles of the indigenous people. Wildlife: Chobe's Puku Flats are renowned for its diverse and prolific wildlife, including the rare Puku antelope. It is also home to large herds of Elephant and Buffalo, large numbers of Hippo, as well as concentrations of Giraffe, Sable, Wild Dog, Lion and the other predators which come down to the river to drink, graze and hunt. This area is an untouched water wilderness sanctuary, ideal for quiet discovery, where game and bird life flourish undisturbed under the protection of the Chobe National Park. Accommodation, scheduled activities & laundry services. All meals, refreshments, local spirits & wines (premium brands excluded). Complimentary mini bar at Chobe Game Lodge and Chobe Savanna Lodge. National park fees and all government levies & taxes. Airport transfers to/from scheduled/charter flights, arriving/departing Kasane Airport for Chobe Game Lodge or Chobe Savanna Lodge.